We argued in our February Compensation Alert eNewsletter that hiring and paying women was not only the right course, but data and common sense reasoning suggest that it’s simply good business. To underline that topic, this month’s Compensation Alert summarizes a survey reported in the Harvard Business Review regarding why women in their early 30s are leaving their companies. Organization leaders report that women are leaving primarily because of flexibility needs and family demands. Women in their 30s disagree. A recent global survey by ICEDR revealed that leaders believe that the majority of women around the age of 30 leave because they are struggling to balance work and life or planning to have children. Whereas men leave because of compensation. However, according to women themselves–and in sharp contrast to the perceptions of their leaders, the primary factor influencing a woman’s decision to leave an organization is pay. In fact, women are actually more likely to leave because of compensation than men. To underline the desire for fair pay for women, a survey conducted by Crain’s Chicago Business and an executive women’s group, the Chicago network found what women consider most important deciding whether to stay or leave a job is pay. Not only are women’s reasons for leaving misunderstood, differences between women and men are overstated. The four top reasons 30-something women and men leave organizations are identical, if in a different order. Do your homework: Analyze job titles and grades or levels with significant populations of both men and women. Determine if there is a bias. If there is, develop a data-driven plan based on your findings. Ask, don’t assume: Instead of talking about women’s needs, talk with them. Ask women what are their needs and wants. Then develop a plan to address the results of the study. Address challenges beyond family and flexibility: While options for flexibility and work-life balance are important, the bottom line is that motherhood is not the primary reason that talented women are leaving organizations. Focusing retention strategies on this alone, without also considering pay and compensation fairness, will ultimately jeopardize retention and advancement efforts. Propose women’s strategies as broader talent strategies: It is good news for organization leaders that gender appears to have little impact on an individual’s reasons for leaving an organization. There is less a need to segment and complicate talent strategies by gender. Instead, create strategies that address the desires of both women and men. There is a disconnect between current talent retention strategies and the desires of top female talent. While work-life balance, flexibility and family are important, they are not the only–or even primary–reasons women leave companies. With men and women expressing common concerns about why they leave jobs, leaders have the opportunity to retain and advance top talent, both male and female, by focusing on common priorities: pay and fair compensation. We welcome your feedback on our Compensation Alert eNewsletters. Please contact me at (847) 864-8979 or nlappley@lappley.com to discuss gender compensation issues or other topics of interest. Companies today are managing more diverse workforces. Pay programs must be designed to attract, retain, motivate and engage employees who have very different pay preferences from employees even a decade ago. A recent study lead by Professor Dow Scott, Professor of Human resources at Loyola University Chicago, along with several other faculties at universities throughout the world, examined how employee characteristics are related to pay preferences. This Compensation Alert eNewsletter summarizes the results of the survey pertaining to U.S. employees. We will review characteristics such as gender, level of age and education, number of employee dependents, compensation differences, and capability and their effect on pay in the U.S. The article authored by Professor Scott and his colleagues appeared in the most recent Compensation & Benefits Review. The original survey covered 1,077 respondents in seven countries. Prior research has found that older workers want more of their pay in benefits than do younger workers. Specifically, older workers prefer retirement programs and job security, whereas younger workers prefer time off, work/life balance and career development. The recent study found that older workers preferred variable pay more than younger workers. It also found that younger workers favored more pay transparency than did older workers, which seems consistent with the willingness of younger workers to share information on social media. One might speculate that workers that are paid more would have the financial capacity to take more risks, and thus prefer variable pay. Participant responses do not confirm that hypothesis, however. The only significant relationship with pay preferences that was found is a negative one between annual pay and pay transparency indicating that transparency is preferred by those with who make less money. Not surprising was the fact that education had a positive relationship with annual pay. While more educated survey respondents preferred pay differences based on capability and variable pay, they were not found to prefer pay transparency. A strong preference for pay variability was found for survey participants who had more dependents. No significant relationship was found between work experience and any of the pay preferences measured. Prior researchers have found that men place more emphasis on extrinsic rewards, such as pay and rewards, than women. Women were found to prefer jobs with good coworker relationships, work/life balance and developmental opportunities. Men were found to prefer pay based on performance more than women. Women preferred skill and seniority-based pay systems. Consistent with prior research, the study found that men prefer variable pay than women do. Older survey participants with more education and more dependents had a strong preference for variable pay than did those who were younger, are less educated and had fewer dependents. 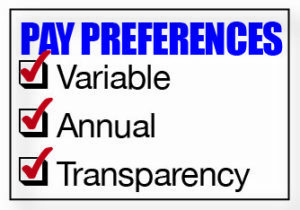 Younger and lower paid participants preferred greater pay transparency. Pay differences that are based on capability were preferred by better-educated employees. We welcome your feedback on our Compensation Alert eNewsletters. Please contact me at (847) 864-8979 or nlappley@lappley.com to discuss pay differences based upon employee characteristics or other topics of interest. As we begin a new year, this eNewsletter Compensation Alert reflects on some of the 2015 compensation trends and makes some projections for the upcoming year. But before getting into a compensation-specific discussion, let me review some broader economic figures. Unemployment is around 5.0 percent, down from 5.6 percent at the end of 2014. While current levels may be at or near full employment, somehow it does not feel like everyone who wants a job has one. In addition to the 7.9 million who are still unemployed, there are 6 million part-time workers who would prefer full time if it were available. The economy created roughly 2.5 million jobs in 2015. That is a 5 percent improvement over 2014, but a 20 percent drop from 3.1 million jobs created in 2013. The participation rate has been falling ever since the recession hit and continues to fall through the recovery. At the beginning of the recession, when the rate was around 66 percent, it has steadily dropped and is now approximately 62.5 percent. Surprisingly, the rate has been dropping even for the prime working age group, so the trend cannot be entirely explained by the simple demographics of baby-boomers moving into retirement. Most likely 2015 will have had its second consecutive year with sub-1 percent inflation. Continued drops in energy costs are almost entirely offsetting any nominal increases in other consumer price categories. However, the Federal Reserve has deemed the economy healthy enough to raise interest rates for the first time in nine years. A recent forecast by the Kiplinger organization predicts inflation to be above 2.0 percent in 2016. Last year was more of the same from a base-pay standpoint. Average salary increase budgets averaged 3.0 percent, unchanged from 2014. Workers, like the Federal Reserve, are beating the drum to get wages to accelerate faster. However, five full years into the recovery, organizations have not had to do so. In addition, short-term incentive plan payouts have held steady in terms of average payouts. There has been an uptick in the use of bonus plans, in particular sign-on and retention bonuses. This may be a sign that the competitive labor market is heating up. It appears that 2016 is shaping up to be another year of continued modest gains in compensation levels. When the pain associated with losing too many workers to competitors or the ability to find qualified applicants reaches a tipping point, wage growth will accelerate. Another factor, increase in inflation could also affect wage rates. However, neither is unlikely to happen this year. Look for modest salary growth in 2016, perhaps a one or two-tenths percentage increase in salary budgets over 2015. There are fast-growing occupational areas such as tech developers of software and systems software, data-base administrators, and cyber-security experts can be expected to command premium pay. Other fast growing fields in health care, transportation, and financial services will also demand attention. On the other hand, some jobs in decline, such as printing press operators, will not exert pressure on pay levels. 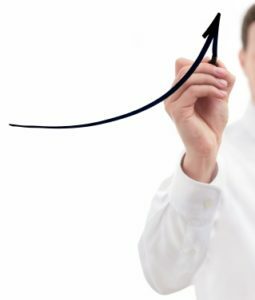 Organizations will likely continue to target key employees and high performers with above average pay adjustments and retention bonuses, while the bulk of the employee population will see more of the same this year. On the plus side, consumer prices will most like stay low. So despite modest increases in salary budgets, those increases are not being eaten by rising prices for goods and services. Please contact me at nlappley@lappley.com or (847) 864-8979 to discuss compensation trends. Feel free also to forward this email to anyone who may be interested.